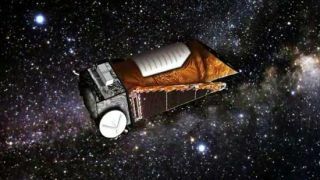 NASA's Kepler space telescope has resumed its search for alien planets after resting for 10 days to work out kinks in its attitude control system, mission officials announced today (Jan. 29). Kepler went into a protective "safe mode" on Jan. 17 after engineers detected elevated friction levels in one of its reaction wheels — devices that maintain the observatory's position in space. Engineers spun the wheels down to zero speed, hoping the break would redistribute lubricant and bring the friction back down to normal. That phase is now over and Kepler is back in action, though it will take time to determine if the problem is solved. "The spacecraft responded well to commands and transitioned from thruster control to reaction wheel control as planned," Kepler mission manager Roger Hunter wrote in the update. "During the 10-day resting safe mode, daily health and status checks with the spacecraft using NASA's Deep Space Network were normal." Kepler flags exoplanets by detecting the telltale brightness dips caused when they pass in front of their parent stars from the instrument's perpsective. The telescope requires three functioning reaction wheels to stay locked onto its roughly 150,000 target stars. When Kepler launched in March 2009, it had four reaction wheels — three for immediate use, and one spare. But one wheel (known as number two) failed in July 2012, so a major problem with the currently glitchy wheel (called number four) could spell the end of the $600 million Kepler mission. It's unknown at the moment if the 10-day rest period will bring wheel number four back into line. "Over the next month, the engineering team will review the performance of reaction wheel #4 before, during and after the safe mode to determine the efficacy of the rest operation," Hunter wrote. The wheel has acted up before without causing serious problems. "Reaction wheel #4 has been something of a free spirit since launch, with a variety of friction signatures, none of which look like reaction wheel #2, and all of which disappeared on their own after a time," Hunter wrote. To date, Kepler has discovered more than 2,700 exoplanet candidates. While just 105 of them have been confirmed by follow-up observations so far, mission scientists estimate that more than 90 percent of them will end up being the real deal.